Sometimes the moments I remember are the quiet ones, when no one else was around. The mountaintop near San Rochegude. The tiny chapel past Miramont. Then there are the moments that are the opposite—all noise and sensory overload and eight centuries of history piled on top of each other. Like the Church of Santa Maria in Los Arcos. We’d been walking for more than forty days. 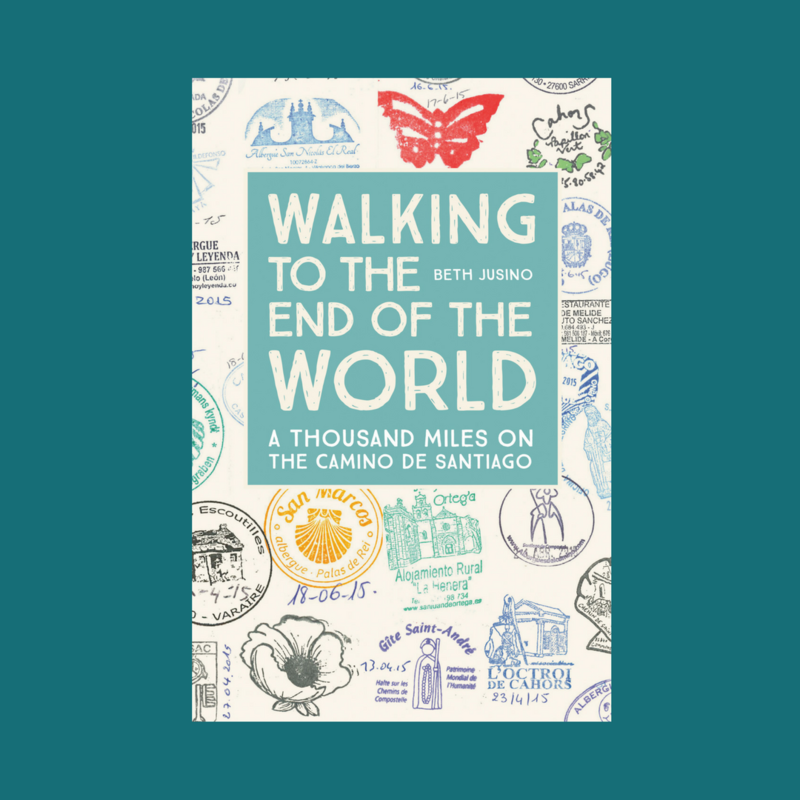 We were past the halfway point of our thousand-mile Camino, we’d had a week to adjust to the culture shock of Spain, and—though we didn’t know it—we were just a few hours from getting sick. On the surface, it wasn’t the most exciting town. Tucked onto the edge of Navarre with a population of just over 1,000, it was neither the biggest nor the smallest place we’d seen. We found a pleasant private albergue in the center of town and settled in for a typical Camino afternoon of laundry and probably a cerveza. The guidebook—or maybe it was our hospitalero—mentioned that the cathedral was open for visitors for a couple of hours in the afternoon. This was a bit unusual in Spain. Unlike France, where churches were always unlocked, and usually unstaffed, in Spain we’d discovered mostly locked doors, or stern people sitting inside the door, charging an entrance fee. I have a thing against paying to visit a church, so we hadn’t seen much of the Spanish style yet. But Los Arcos was quiet, and we had arrived early, and we didn’t really have a pod of fellow pilgrim friends at that point, so…okay, let’s stop in and see what it’s like. On the outside, it looked like most of the other churches we’d passed along the Way. (And the Way is designed to go past a lot of churches.) A 12th century building, under a stately tower with storks nesting on top. Plain walls. Not many windows. But we’d barely walked through the doors before it was obvious that this was a cathedral like nothing we’d seen yet. We’d seen hints, in Puente La Reina especially, that the churches in Spain had a different aesthetic than the stark Romanesque and Gothic styles we’d mostly seen in France. The original bare marble and tall windows had been covered by heavy Baroque renovations and design. Ferdinand and Isabella’s gold from the New World had found its way to even the smallest of chapels. But nowhere and nothing we saw before or after was like the Church of Santa Maria. Here, every single inch of every single surface was covered with something. Every pillar of wood and pew was carved. Every inch of wall had some kind of design. We wandered through this place for two hours, trying to take in the gilded wallpaper, elaborate carvings of saints, gaudy designs on the dome, paintings everywhere. Nooks were filled with relics, statues, and a mannequin in a glass coffin that I still don’t understand. The choir loft was full of displays, including enormous old books illuminated on velum. The displays of saints around the room mostly depicted bloody battles and pious, serious saints. But then a pipe organ that had been added in the early 20th century was full of…cartoon faces? When the onslaught of images became too much, there were long shadows stretching across a rose-filled cloister just outside. The overall effect of the church left me a little stunned, my senses overloaded. But it also made me smile. It was crazy more than beautiful, this visual representation of eight centuries of European Christianity, all in one giant room. It was like your grandmother’s overcrowded knick-knack cabinet, where everything from the antique china to the snow globe she bought in Vegas is crammed onto a shelf and threatening to topple out at any minute. 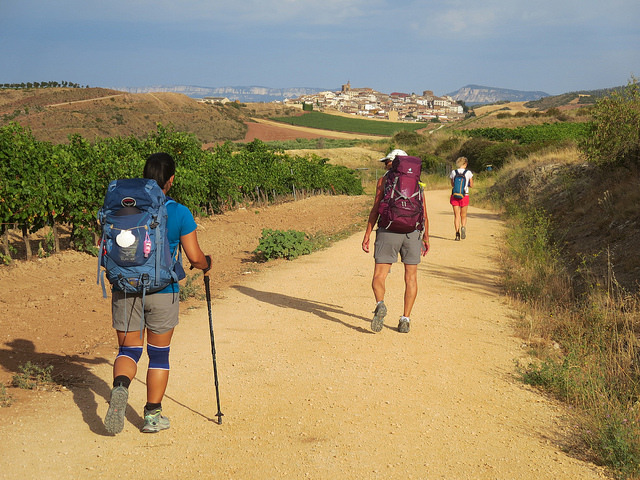 It was a bit like the Camino itself.